This article will explore how one of the most prolific Italian newsreel production companies, Radar Cinematografica, depicted the student protest movement and the sociopolitical and cultural gap between university students and the establishment in that year. The newsreel items under analysis are “Italia — L’università è in crisi” [Italy – University is in crisis] (R0179), “Italia — L’ateneo romano alla ribalta della cronaca” [Italy – Rome university is at the fore of the news agenda] (R0184) and “Italia — L’università italiana è ancora all’ordine del giorno” [Italy – Italian university is still on the agenda] (R0194). More specifically, this article aims to assess how these newsreels reflect Michael Pickering’s concept of the ‘stereotypical Other’ and how alterity is articulated in the constructions of the clash of sociocultural world views between activists and the establishment in Italy. According to this author, the difference between the Self and the Other is established on the basis of a self-centered, pre-conceived notion of the Other, what the author also calls the “external Other.”  The Other is, therefore, defined in opposition to the Self, based on a relation of Me/ Us/ Them. This was the relation shaped by the Italian Press in 1968, when it depicted student activists as “dangerous, left-wing, and a fascist threat to civil order,” while it portrayed public institutions “as defenders of democracy and order.”  “University is ill” draws on these studies and complements them by focusing on an up-to-now less-researched Italian medium: Radar newsreels. The three newsreel items under scrutiny were screened, respectively, in February, March, and April 1968. These items have been selected based on the fact that all were produced by the same film production company, Radar Cinematografica. 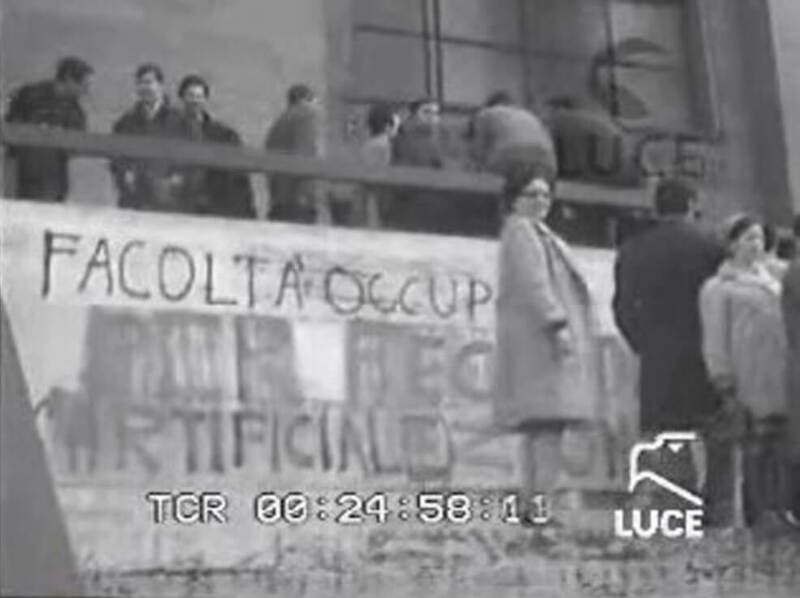 This company was the only Italian newsreel producer which, in 1968, released three items entirely dedicated to the university crisis and the student protests that took place at the universities. However, Radar was not the only newsreel producer at the time. Other companies such as Compagnia Italiana Attualità Cinematografiche (CIAC) or Fulco Film produced only one or two newsreel items about this matter in that year. 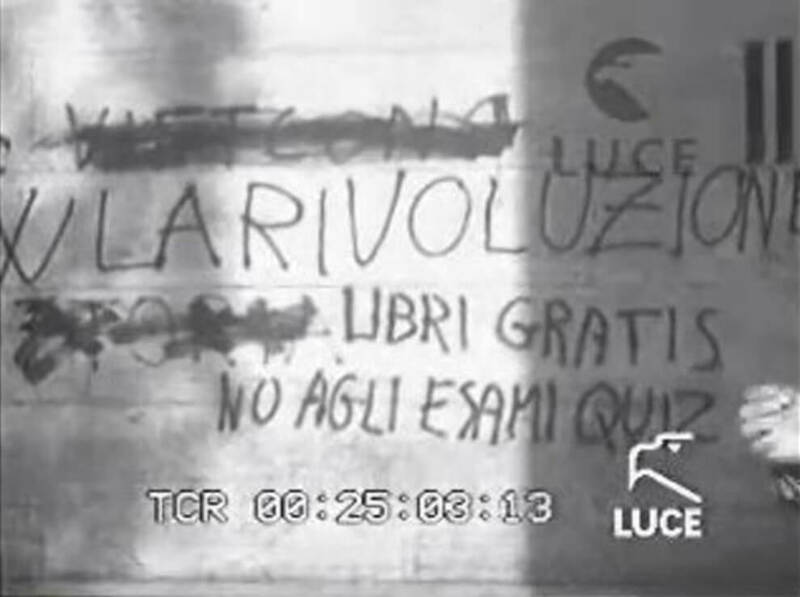 In fact, based on the information available in the Archivio Storico Luce, newsreels produced by the latter companies such as Cinemondo, Tempi Nostri, Settegiorni 7G and Notizie Cinematografiche each only included one newsreel item about the student movement. This indicates that these companies did not give identical relevance to the subject. For this reason, this article will exclusively focus on items produced by Radar and focusing on university students. This last specification is important for the purpose of this article since, besides the three selected newsreel items to be analyzed herein, Radar also screened another two that brought to the foreground the tension lived by the younger generation, this time more specifically that of high school pupils. 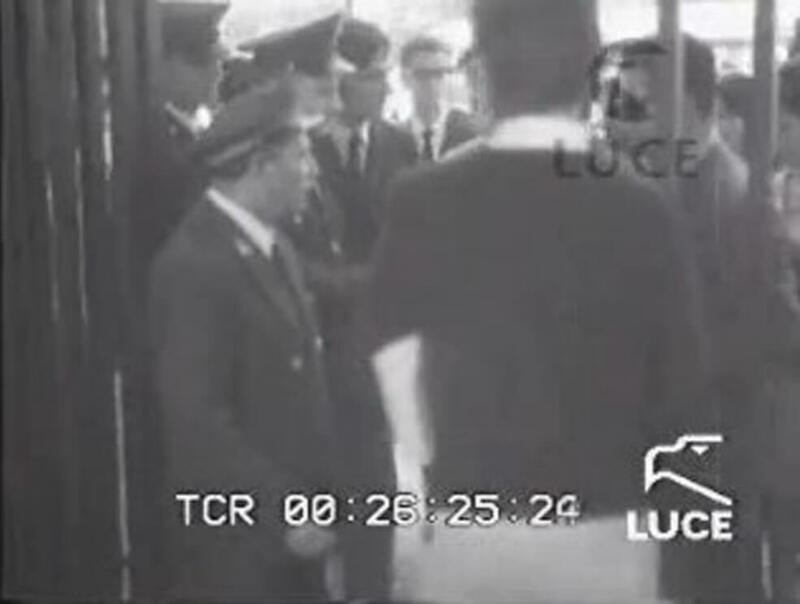 The first was screened on March 13, 1968 and focused on the strike of the high school pupils at Liceo Parini in Milan. The second was screened at the end of that year, on December 18, and dwelt on the protest actions carried out by school pupils in the same city. These two newsreel items have therefore been excluded from the following analysis, since they do not fit into the goal of researching the constructions of the student protests at the universities. 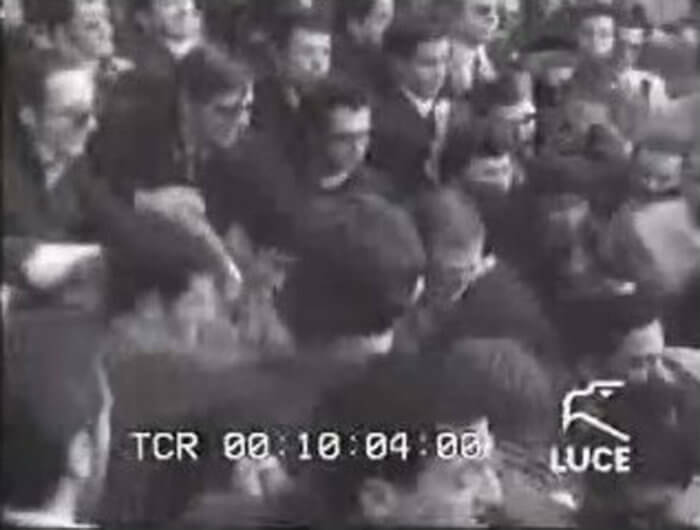 Furthermore, unlike the narrow coverage of these events by the other companies, the three newsreel items produced by Radar and examined here display a chronological coverage of the events, which allows undertaking a consistent and broad analysis about different moments of the student movement in Italy during the height of the 1968 university protests. 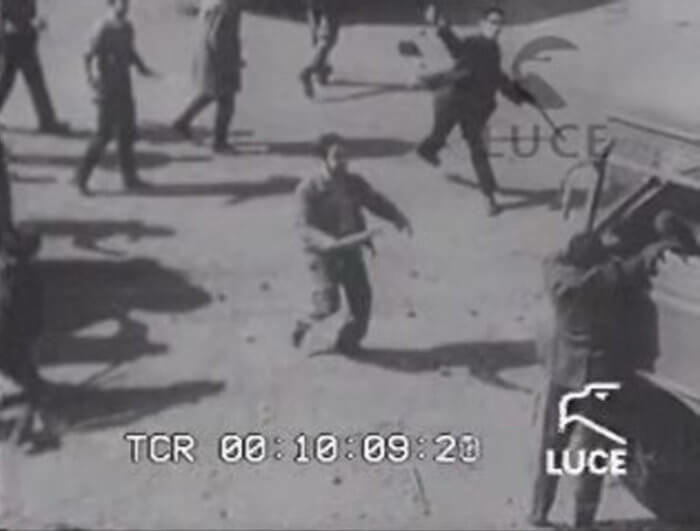 After an introductory historical contextualization of the Italian student crisis, I will examine each newsreel item by focusing on the portrayal of the signs of alterity of the students and their protest actions as featured mainly in the voice-over commentaries. Details pertaining to images or music will also be provided, albeit primarily to support the textual discourse analysis. At the end of the 1960s, Italy was one of the Western European countries where the student movement was felt in a particularly intense way. 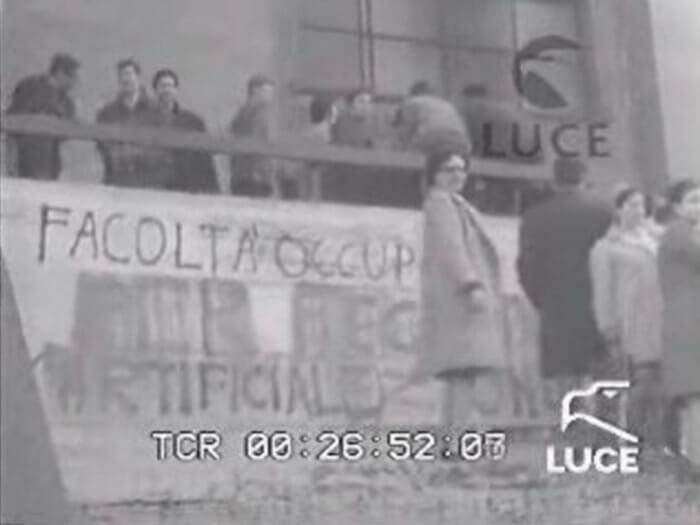 Through barricades and sit-ins, by occupying faculty buildings and shouting words of protest, as well as joining in demonstrations, Italian students perceived themselves as the alternative for a new society. They rebelled against the establishment and sought to give the get-go for a deep change of Italian academy and society, at a political, social and cultural level. Throughout the 1950s and the first half of the 1960s, Italy knew great progress and underwent a process of increasing modernization. The miracolo economico [economic miracle] — as this phenomenon became historically known — paved the way to changes in a predominantly rural reality, and there was a strong investment in revitalizing economy and industry. This rapid economic growth not only increased the purchasing power of the population and generally improved their living conditions, but also contributed to sociocultural transformations in Italian society. The opportunity to experience the commodities of a consumerist society, the rise of social mobility, and the urbanization of lifestyles are some of the signs of this upsurge of liberalization. Nevertheless, from the point of view of the late-1960s’ dissident students, these economic improvements were not joined by an effective modernization of universities or public institutions. On the contrary, these still remained tied to conservative values, to the executive orders of the political rulers, and to structures of strict hierarchies. The open criticism of students at the universities and the constant questioning of the status quo are, in fact, the reasons why the Italian student movement presents itself as a deep fracture between young people and society at the end of the Sixties  — a sociopolitical fracture that, as will be shown next, is permanently exposed in the many representations of the Italian student crisis presented in the 1968 Radar newsreel items under study in this article. News and events in the Radar newsreels were commented upon in a lively, extroverted, and humorous way. 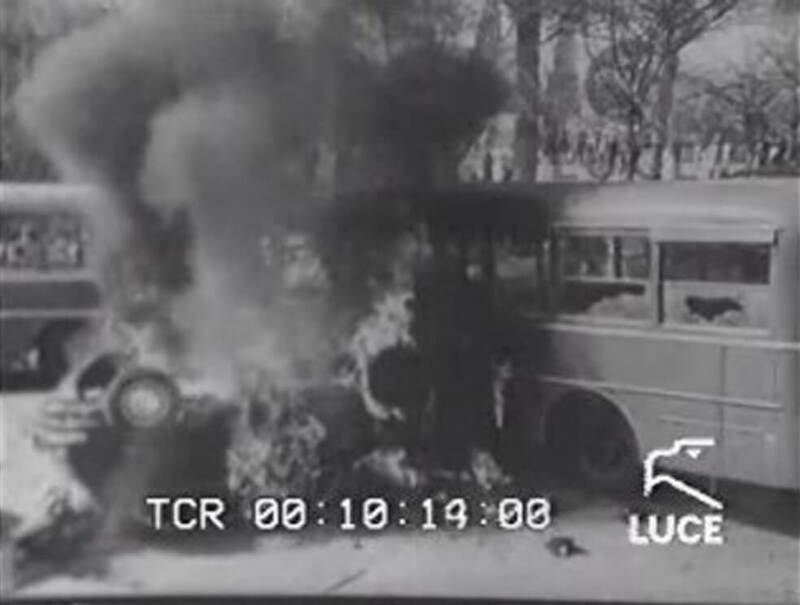 Particularly in the second half of the 1960s, the tastes, trends and protests of the younger generations became more and more prominent in these newsreels. This fact could explain why the student protests came into the limelight in the first half of 1968, and even were the opening item on the days they were screened. As I will argue next, the moments that were captured in the three selected Radar newsreel items contribute to articulate a construction of the protesters as the Other in opposition to the Self, or the established society. By established society I mean the civil society, defender of public order and stability in the academic institutions and opposed to conflicts which could call into question the sociocultural customs that had been the norm up to then. Furthermore, the three items can be viewed as stages in a gradual process of alterization based on the disapproval and condemnation of the student activists’ protest actions. At 25´: 31´´, the background music of the newsreel item changes. This new piece of music, which continues until the end of the item, picks up the pace into a faster rhythm, thus increasing the dramatic tension for the viewers. The tone of the voice of the commentator also deepens as the most radical features of the student protests are listed, such as the confrontations between the students and the police in Florence, the organization of counter courses without professors in Turin, or the strike of medical students in Rome. In fact, this multi semiotic discourse contributes to the process of alterization: both the comments of the voice-over as well as the audiovisual elements join together to instill the impression of disorderly radicalism within the student movement, promoting the notion in the public opinion that the student activists were responsible for the crises lived at the universities. The relevance given to the most radical forms of protest within the student movement is even more evident in the newsreel item “Italy — Rome University is at the fore of the news agenda” (R0184). This item was screened on March 6, 1968, five days after the confrontations between students and the police in Valle Giulia, Rome, on March 1. Here, the process of alterization occurs through the association of images of disorder and violent student behavior, heard straight away in the initial comment by the voice-over: “Strikes, occupations, demonstrations and brawls: students of the Italian universities are making the revolution.”  Focusing on the protests at the main campus of the capital, a center stage is given to the students who organized “illegal occupations and forced closures,”  which then made the academic system come to a halt. This newsreel item also argues that there is disagreement amidst the students themselves, who are incapable of coming up with a common fighting strategy for the student movement: “What do they really want? They don’t agree on this matter: there are those who defend a global reform of the system, those who want the students to have full power, those who defend dialogue, and those who defend violence.”  In fact, as the voice-over accounts for the multiple demands of the youngsters, it is possible, during several seconds, to see scenes of students pushing each other in opposite directions. The crowd moves aimlessly back and forth and even some individuals behave more aggressively towards their peers, pushing and showing them out of the way. This selection of frames, such as the one shown immediately below, together with the comments, contributes to crystalize this idea of variations among the protesters. At the end of the clip, the confrontations of Valle Giulia are mentioned, with a direct appeal to the audience: “And you still haven’t seen anything — while at the main student campus the demonstration started to look like a boxing match, at the Architecture faculty something worse happened: a true and real fight.”  The sensationalist tone (especially the stress on words such as boxing and true and real fight), supported by the paso-doble-like music, greatly contributes to the construction of vandalism in these confrontations. In fact, the trumpet solo and the ornaments typically associated to Hispanic cultures insufflate the clip with an exotic and wild feeling and therefore indirectly associate these characteristics with the activists. This musical maneuver helps to articulate them as the ‘stereotypical Other,’ as activists get defined in opposition to the Self, as put forth by Pickering when referring to a Us/Them relation. Through this construction of student activism, protesters are thus automatically excluded from a law-abiding collective self, which disapproves violence and presents them as a major threat to public order. As a matter of fact, the chain of succession of the following images, going from activists brandishing sticks to vehicles burning, works also as a constructed crescendo of violence, aimed at increasing the perceived gulf between the orderly established society and the students who destroy property. On April 17, 1968, the student protests return to the limelight in “Italy — Italian university is still on the agenda” (R0194). This time, the news does not focus so much on the protest actions of the students, but more on the efforts made by the government and the academic institutions to provide solutions to the problems at the universities. 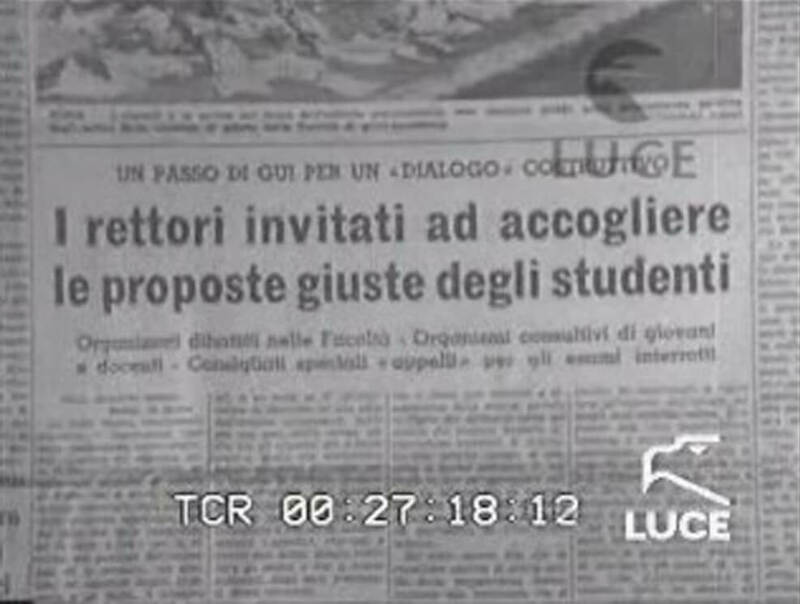 In fact, more than a month has passed following the confrontation at Valle Giulia, and the main concern of this newsreel item is to highlight the fact that the academic realm is once again quiet, as can be heard in the first sentence by the voice-over: “Calm is returning to our universities.”  The iterative use of the possessive our functions as a linguistic device for the alterization of the student activists. As Pickering advocates, repetition and reiteration of alterization mechanisms are essential for the creation of the ‘stereotypical Other’ as an effective concept. More specifically, in the case of the newsreel items under analysis, this use of the possessive our contributes to associate the Self with the ‘order,’ as opposed to the Other — the students — constructed as the agents of unrest. After the initial reassuring statement, the focus is on the government measure of only granting access to university campus to students and teachers. As the voice-over is highly complementary of this measure, which is argued as the right thing to do to stop the atmosphere of disorder that had recently spread throughout the universities, images such as the following can be seen during long seconds. To the sound of a non-descript jazz piece, they display well-dressed students waiting in line for the individual control carried out by uniformed men — maybe policemen, though it cannot be discerned with certainty — at the entrances to the university. This condemnation of radicalism and disrespect for the order even within the student movement is further reinforced by the repetition of several scenes where students push each other and where the walls of the faculties are painted with inscriptions. Some of these images were already exhibited in previous newsreel items. In opposition, these images of chaos at the universities are followed by the final comments from the voice-over, praising the measures of the government in solving the academic crisis. The passing of a bill with reforms for the universities, as well as the opening of the Ministry of Education to dialogue with students and academic boards, are two aspects that are brought to our attention by showing photos of newspaper headlines such as the ones that can be seen below. They stress the availability of the Minister of Education, Luigi Gui, to find solutions to the current problems of the academic system. In fact, this idea of a return to order is continually repeated, and it is this repetition that contributes to articulating alterity in this newsreel item. By bringing to the foreground the many measures that the institutions (governmental and academic) have taken towards solving the university crisis, a global image is presented: one of control and increasing social tranquility. The soundtrack, mainly composed of a slow and pleasant jazz piece, helps to make up this notion of returning to normality. Additionally, student protests are represented as extremist and illegitimate events — an aspect that contributes to reinforce, in the public eye, the idea that the academic crisis is constructed as being all about turmoil and unrest. To sum up, the three selected items contribute to a progressive construction of the student activists as outsiders to established society. In fact, each item is a step of a gradual process of alterization that depicts the actions developed by the protesters at the universities with a negative bias, portraying them as threats to the balance of social order. The first newsreel item criticizes the climate of instability lived at the universities and conveys the idea that the responsibility for this unrest lies with the protest actions that are being carried out by the students. The normal functioning of academic life is further disrupted by an increase in violence in the student movement, as is demonstrated in the second item. Here, the disapproval of the voice-over is explicit against the most radical forms of protest, linking student activism to violent radicalism in an attempt to condemn all claims for change. This generalization is a step forward in the viewing of students as the ‘stereotypical Other,’ i.e., those who simply do not respect public property or social order. The alterization process reaches its peak in the third item, when the universities are seen to be under control again, calm and orderly. Authority has stepped in and turmoil has been contained. On the one hand, students who do not comply with the rules are marginalized and their protest actions are depreciated. On the other hand, government’s efforts to solve academic problems are praised and the law-abiding collective self is validated. In all three newsreels, there are common representations of student protests that shape the opposition between students and the establishment. Crisis, radicalism, violence and non-democratic extremism are ideas associated with the student movement that are constantly evoked in the comments of the voice-over. Also, the images that illustrate the speech or even the changes in the soundtrack, adopting a more dramatic or a quieter tone, contribute to reinforce the notion of disorder and turmoil linked to the protest actions of the students. Another important aspect to highlight is the lack of impartiality when it comes to divulging information. This is clear in the recurrent use of the expression our universities and the description of the protest actions as illegitimate excesses or shameful disturbances. Both mark the boundaries between Us/Them, as they reflect the view, the opinions of one of the parts against the other. Finally, it must be said that in this articulation of the students as the ‘stereotypical Other,’ “those who are ‘othered,’” in Pickering’s terms, “are unequally positioned in relation to those who do the ‘othering.’”  That is to say that students who are considered radical activists by the voice-over are not considered equal to the established society that marginalizes and ignores them. In fact, the lack of student voices, their interests and motivations, is evident, as the students’ concrete demands for a reform in the academic reality are not mentioned. 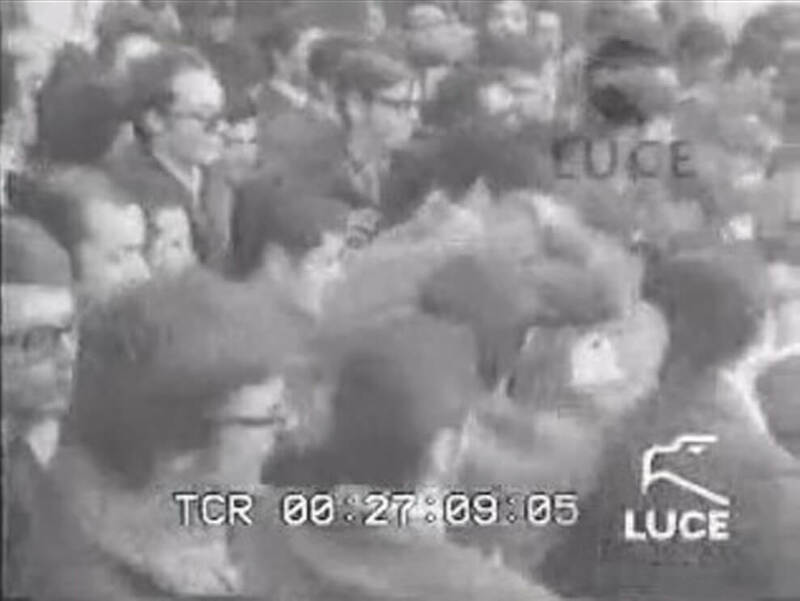 Thus, the message of the ‘dominant part’ prevails, centered in blaming the students for the university crisis and in supporting the government policies and the institutions of the establishment to ensure the public order — two key elements in the creation of the many representations of the Italian student crisis of 1968 depicted in these newsreels. Through the constant evocation of the order/disorder or tranquility/radicalism dichotomy, the ideological fracture that marked the 1968 student movement is echoed, and the opposition between the students and the establishment in that year takes shape. Inês Gamelas, “ ‘University is Ill:’ Representations of the Italian Student Crisis in 1968 Radar Cinematografica Newsreels.” On_Culture: The Open Journal for the Study of Culture 4 (2017). <http://geb.uni-giessen.de/geb/volltexte/2017/13389/>. I would like to thank the editor of this volume, Danae Gallo González, for providing valuable suggestions during the elaboration of this article. It has profited significantly from her constructive remarks. See Martin Klimke and Joachim Scharloth, “1968 in Europe. An Introduction,” in 1968 in Europe: A History of Protest and Activism, 1956–1977, eds. Martin Klimke and Joachim Scharloth (New York/London: Palgrave Macmillan, 2008), 1–9, here: 2. The three newsreel items under analysis are available online at the official website of the Archivio Storico Luce, Istituto Luce Cinecittà (<http://www.archivioluce.com/archivio/>). I thank the Italian Archive for the permission to reproduce in this article text passages and images of the three selected newsreel items. Michael Pickering, Stereotyping. The Politics of Representation (New York: Palgrave, 2001), 71. See Pickering, Stereotyping. The Politics of Representation, 71. Holger Nehring “ ‘Generation,’ Modernity and the Making of Contemporary History: Responses in West European Protest Movements Around ‘1968,’ ” in “Talkin’ ‘bout My Generation:” Conflicts of Generation Building and Europe’s ‘1968,’ ed. Anna von der Goltz (Göttingen: Wallstein, 2011), 71–94, here: 86. When I tried to look into those four items at the Archivio Storico Luce, I found that two of them were unavailable for online viewing, those of Cinemondo and Tempi Nostri. The one released by Notizie Cinematografiche is too generalist, a mere sum-up of the student movement in Europe. Settegiorni 7G was the only newsreel that gave an account of the protest actions carried out by students at Italian universities. Still, it focused more on the birth of the Paolo Rossi Circle, a group named after a student activist killed in 1966, created with the aim of finding solutions for the problems faced by students and professors in daily academic life. To consult these last two items, see Istituto Luce Cinecittà, “Gli avvenimenti dramatici del secondo Dopoguerra e le tensioni internazionali; il movimento studentesco in Europa,” in Notizie Cinematografiche N0060, n. d., accessed September 23, 2017 <http://www.archivioluce.com/archivio/jsp/schede/videoPlayer.jsp?tipologia=&id=&physDoc=73383&db=cinematograficoCINEGIORNALI&findIt=false&section=/>; and “Università: nasce il circolo ‘Paolo Rossi,’” in Settegiorni 7G S0094, March 5, 1968, accessed September 23, 2017 <http://www.archivioluce.com/archivio/jsp/schede/videoPlayer.jsp?tipologia=&id=&physDoc=67116&db=cinematograficoCINEGIORNALI&findIt=false&section=/>. This item can be consulted in Archivio Storico Luce. See Istituto Luce Cinecittà, “Italia — Scioperano gli studenti del Liceo Parini,” in Radar Cinegiornali R0186, March 13, 1968, accessed September 23, 2017, <http://www.archivioluce.com/archivio/jsp/schede/videoPlayer.jsp?tipologia=&id=&physDoc=59692&db=cinematograficoCINEGIORNALI&findIt=false&section=/>. This item can also be consulted in Archivio Storico Luce. See Istituto Luce Cinecittà, “Italia. 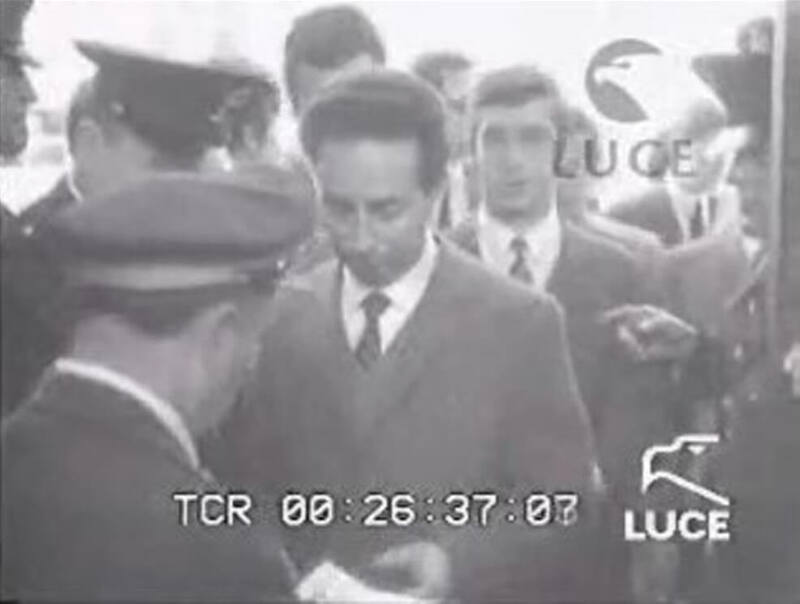 Ancora contestazioni studentesche,” in Radar Cinegiornali R0245, December 18, 1968, accessed September 23, 2017, <http://www.archivioluce.com/archivio/jsp/schede/videoPlayer.jsp?tipologia=&id=&physDoc=60005&db=cinematograficoCINEGIORNALI&findIt=false&section=/>. See Arthur Marwick, The Sixties: Cultural Revolution in Britain, France, Italy, and the United States, c. 1958–c. 1974 (Oxford/New York: Oxford University Press, 1998), 546–548. For a detailed description of this period in Italian history, see Guido Crainz, Storia del miracolo italiano: Culture, identità, trasformazioni fra anni cinquanta e sessanta (Roma: Donzelli, 1997). Jan Kurz and Marica Tolomelli refer that mass migrations from the exclusively rural South to the industrialized North, the growth of the working class (living mostly in the periphery of big cities, often in poorly conditions), the deconstruction of the traditional family structure and the gradual process of cultural secularization are some of the direct changes promoted by the fastness of the economic boom, which consequently led to the increase of ideological disparity between the younger generation and that of its elders. See Jan Kurz and Marica Tolomelli, “Italy,” Chapter 7, in 1968 in Europe: A History of Protest and Activism, 1956–1977, eds. Martin Klimke and Joachim Scharloth (New York/London: Palgrave Macmillan, 2008), 83–96, here: 84. Marica Tolomelli, “Italian Youth in the 1960s and the Preconditions for Building a Generation,” in “Talkin’ ‘bout My Generation:” Conflicts of Generation Building and Europe’s ‘1968,’ ed. Anna von der Goltz (Göttingen: Wallstein, 2011), 51–70, here: 54. According to Silvia Casilio, it is interesting to notice that, until 1968, most of the Italian press remained indifferent to cultural and political movements of the young protesting generation. Only when the uproar escalated did the matter become unavoidable for the public eye and the press began to pay attention to the students’ contestation, nevertheless referring to it as a problem of public order. See Silvia Casilio, Una Generazione d’Emergenza. L’Italia della Controcultura (1965–1969) (Milano: Mondadori Education, 2013), 147. On Proposal no. 2314 and its measures related to the education reform, see Norbert Frei, 1968: Jugendrevolte und globaler Protest (München: Deutscher Taschenbuch Verlag, 2008), 166. Fred Halliday, “Students of the World Unite,” in Student Power. Problems, Diagnosis, Action, eds. Alexander Cockburn and Robin Blackburn (Harmondsworth: Penguin Books, 1969), 287–326, here: 304. See Fred Halliday, “Students of the world unite,” 304. See Marcello Flores and Alberto De Bernardi, Il Sessantotto (Bologna: Il Mulino, 2003), 194. See Nehring “ ‘Generation,’ Modernity and the Making of Contemporary History,” 84–85. Marica Tolomelli clarifies the reasons for the Italian students’ outrage towards the war in Vietnam and the impact of this major international political event in the process of increasing student politicization in Italy: “The notion of an unfair war waged by one superpower against one of the poorest countries in the world, and the shocking images of war that were seen throughout the world, provoked growing social protests in Italy as well as in many other countries. […] At the beginning, the dissent among students was shaped by moral and emotional reactions towards the brutality of the war. Later on, when they began to look for explanations, students considered the war in the context of a more general social analysis and a more wide-ranging criticism of the international political order and the role of Western countries within it. From this perspective, the Vietnam War was the collective initiation that, in a second step, led to the emergence of a political consciousness.” Id. “Italian Youth,” 61. See Silvia Casilio, Una Generazione d’Emergenza. L’Italia della Controcultura (1965–1969) (Milano: Mondadori Education, 2013), 130. Gerd-Rainer Horn, The Spirit of ’68. Rebellion in Western Europe and North America, 1956–1976 (Oxford: Oxford University Press, 2007), 84. The excerpt here presented was put forth by Gerd-Rainer Hord, who translated from German into English the words of Jan Kurz. The original reads: “Zehntausende von Studenten befanden sich im Ausstand, Hunderttausende von Studenten sahen keine Möglichkeit, ihre Studien normal weiterzuführen. Die Universitäten waren blockiert, belagert oder besetzt; die Professoren standen vor verschlossenen oder leeren Räumen; regulärer Unterricht fand nur noch irregulär statt; Examen wurden verschoben oder fielen völlig aus; der Kontakt zwischen Studentenschaft und Lehrkörper bestand faktisch nicht mehr. Controcorsi, Vollversammlungen und Kommissionen, Diskussionen, Besetzungen und Demonstrationen ersetzen den Studienalltag der Akteure. Ideologische Grenzen verschwanden in den Protesten zugunsten der Aktion, die im Autoritarismus einen gemeinsamen Feind hatte.” Jan Kurz, Die Universität auf der Piazza. Entstehung und Zerfall der Studentenbewegung in Italien 1966–1968 (Köln: SH Verlag, 2001), 213. Jan Kurz and Marica Tolomelli refer to the events in Valle Giulia on the March 1, 1968 as “[t]he turning point in the nationwide movement […].” Id. “Italy,” 89. Kurz and Tolomelli, “Italy,” 89. See Fred Halliday, “Students of the world unite,” 304–305. The empathy for the causes of the working-class movement led many students to actively participating in protest actions scheduled by the working classes during 1968 and 1969. Besides, as referred by Silvia Casilio, it is interesting to notice that, after the dimming of the student movement at the end of 1968, many students stopped protesting in the streets and at the universities and joined the workers outside the factories and companies. See Silvia Casilio, Una Generazione d’Emergenza. L’Italia della Controcultura (1965–1969) (Milano: Mondadori Education, 2013), 221. See Flores and De Bernardi, Il Sessantotto, 191. See Marco Grispigni and Leonardo Musci, eds., Guida alle fonti per la storia dei movimenti in Italia (1966–1978) (Roma: Ministero per i beni e le attività culturali. Direzione generale per gli archivi, 2003), 178. In the site of the Archivio Storico Luce, on the “Radar” page, there is no information about the number of cinema or view rooms or the cities in Italy where these newsreel items were screened. See Istituto Luce Cinecittà, “Radar” (1965–1982), n. d., accessed September 23, 2017, <http://www.archivioluce.com/archivio/ViewPDFServlet?theArch=cinematograficoCINEGIORNALI&id=IL5000096361>. Radar censorship certificates can be found upon request at the website <www.italiataglia.it>, accessed September 22, 2017. Despite my efforts to contact the staff of Italia Taglia, I did not receive any reply by the time of publishing. This information about the Radar newsreels can be looked up on the site of the Archivio Storico Luce. See Istituto Luce Cinecittà, “Radar” (1965–1982), n. d., accessed September 23, 2017, <http://www.archivioluce.com/archivio/ViewPDFServlet?theArch=cinematograficoCINEGIORNALI&id=IL5000096361>. 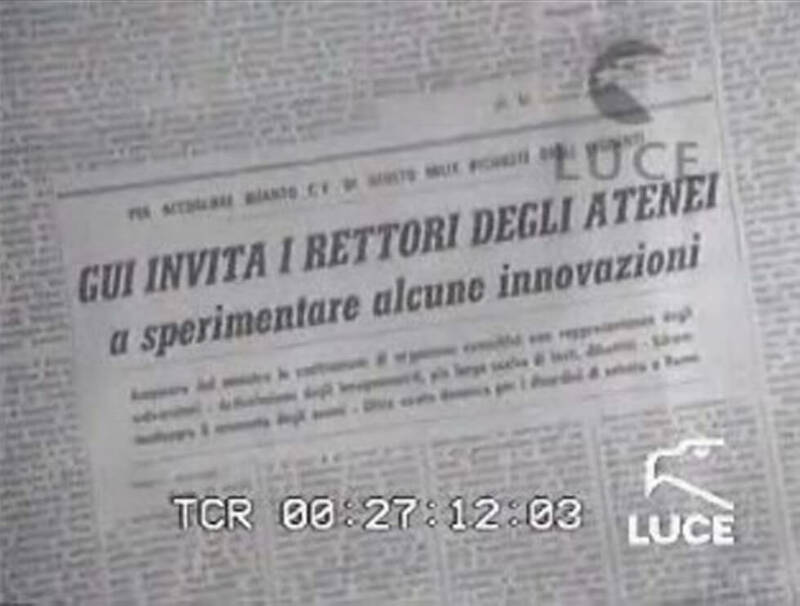 Istituto Luce Cinecittà, “Italia — L’università è in crisi,” Radar Cinegiornali R0179, February 14, 1968, accessed September 23, 2017, <http://www.archivioluce.com/archivio/jsp/schede/videoPlayer.jsp?tipologia=&id=&physDoc=59648&db=cinematograficoCINEGIORNALI&findIt=false&section=/>. This newsreel item lasts for 01´:29´´. As a matter of simplicity, I will transcribe all the comments from the voice-over in each newsreel in English, signing them with quotation marks. All translations were made by the author of this article. Istituto Luce Cinecittà, “Italia — L’università è in crisi” (R0179), 24´:49´´–24´:50´´. For the purposes of quoting the voice-over comments and the frames of the pictures taken from the items, I use the timer as displayed on the original item. Istituto Luce Cinecittà, “Italia — L’università è in crisi” (R0179), 25´:24´´–25´:27´´. Istituto Luce Cinecittà, “Italia — L’università è in crisi” (R0179), 25´:04´´–25´:07´´. Istituto Luce Cinecittà, “Italia — L’università è in crisi” (R0179), 25´:03´´. Istituto Luce Cinecittà, “Italia — L’università è in crisi” (R0179), 24´:58´´. Istituto Luce Cinecittà, “Italia — L’ateneo romano alla ribalta della cronaca,” Radar Cinegiornali R0184, March 6, 1968, accessed September 23, 2017, <http://www.archivioluce.com/archivio/jsp/schede/videoPlayer.jsp?tipologia=&id=&physDoc=59678&db=cinematograficoCINEGIORNALI&findIt=false&section=/>. This newsreel item lasts for 00´:51´´. Istituto Luce Cinecittà, “Italia — L’ateneo romano alla ribalta della cronaca” (R0184), 09´:28´´–09´:33´´. Istituto Luce Cinecittà, “Italia — L’ateneo romano alla ribalta della cronaca” (R0184), 09´:57´´–09´:58´´. Istituto Luce Cinecittà, “Italia — L’ateneo romano alla ribalta della cronaca” (R0184), 09´:43´´–09´:51´´. Istituto Luce Cinecittà, “Italia — L’ateneo romano alla ribalta della cronaca” (R0184), 10´:04´´. Istituto Luce Cinecittà, “Italia — L’ateneo romano alla ribalta della cronaca” (R0184), 10´:02´´–10´:09´´. Istituto Luce Cinecittà, “Italia — L’ateneo romano alla ribalta della cronaca” (R0184), 10´:09´´. Istituto Luce Cinecittà, “Italia — L’ateneo romano alla ribalta della cronaca” (R0184), 10´:14´´. Istituto Luce Cinecittà, “Italia — L’ateneo romano alla ribalta della cronaca” (R0184), 10´:10´´–10´:14´´. As Michael Pickering points out: “In considering the concept of the Other, it is important to remember that those who are ‘othered’ are unequally positioned in relation to those who do the ‘othering’. The latter occupy a privileged space in which they can define themselves in contrast to the Others who are so designated as different, with this designation reinforcing and prolonging the inequalities involved by seeming to confirm and prove them.” Id., Stereotyping. The Politics of Representation, 73. Istituto Luce Cinecittà, “Italia — L’università italiana è ancora all’ordine del giorno,” Radar Cinegiornali R0194, April 17, 1968, accessed September 23, 2017, <http://www.archivioluce.com/archivio/jsp/schede/videoPlayer.jsp?tipologia=&id=&physDoc=59725&db=cinematograficoCINEGIORNALI&findIt=false&section=/>. This newsreel item lasts for 01´:23´´. Istituto Luce Cinecittà, “Italia — L’università italiana è ancora all’ordine del giorno” (R0194), 26´:18´´–26´:19´´. See Pickering, Stereotyping. The Politics of Representation, 72. Istituto Luce Cinecittà, “Italia — L’università italiana è ancora all’ordine del giorno” (R0194), 26´:25´´. Istituto Luce Cinecittà, “Italia — L’università italiana è ancora all’ordine del giorno” (R0194), 26´:37´´. Istituto Luce Cinecittà, “Italia — L’università italiana è ancora all’ordine del giorno” (R0194), 26´:32´´–26´:41´´. Istituto Luce Cinecittà, “Italia — L’università italiana è ancora all’ordine del giorno” (R0194), 26´:47´´–27´:02´´. Istituto Luce Cinecittà, “Italia — L’università italiana è ancora all’ordine del giorno” (R0194), 27´:09´´. Istituto Luce Cinecittà, “Italia — L’università italiana è ancora all’ordine del giorno” (R0194), 26´:52´´. Istituto Luce Cinecittà, “Italia — L’università italiana è ancora all’ordine del giorno” (R0194), 27´:12´´. Istituto Luce Cinecittà, “Italia — L’università italiana è ancora all’ordine del giorno” (R0194), 27´:18´´. Pickering, Stereotyping. The Politics of Representation, 73.